Another year, another AWP in the books. 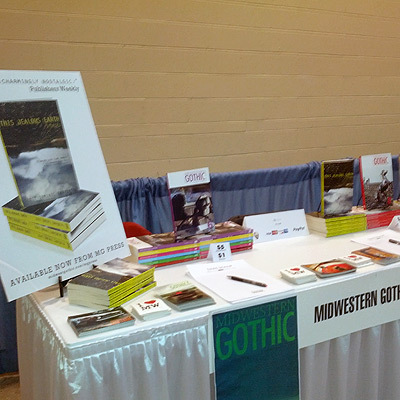 First off, a big thank you to everyone who stopped by the table and everyone who picked up a book. We weren’t exactly sure how stories focusing on the oeuvre of the Midwest would play in an “away” stadium (the Northeast), but it seemed like most of the folks who stopped by were curious about the talent that lives in or has passed through the region. (And who knows, maybe it was the distinctly Midwestern weather—snow, jacket-snapping wind, more snow—that put people in the mood. Our first two days were mostly spent trying to get oriented and settled in—we flew in separately and our flights were both delayed, which hamstrung us a bit when it came to attending any of the off-site events (read: drinking). But once we hit our groove, we met a ton of great people. One of the best parts about attending events like that is getting to meet contributors, and they were out in force. James Allen Gill, Angela Palm, Jason Harris, Joe Sacksteder, Abby Norwood—the list goes on and on, and it truly was a pleasure. We also met loads of other editors from other journals, all curating fiction, poetry, non-fiction and art from each of our unique perspectives. The Hawaii Review, Bull: Men’s Fiction, Soho Press and Booth to name just a few. Like them, we didn’t get a ton of time to wander around the floor, but there are some seriously beautiful books being put out, and it was great to swing by their tables and peruse as a fan. But, it is AWP, and we did to get a little bit of schmoozing in—Friday night we stopped by the Bull event in a store called Ball and Buck. If you’re familiar with their journal (and you really should be—it’s a beauty) this place was custom-made for them. 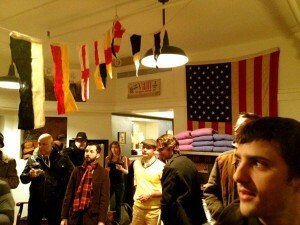 High-end outdoor menswear, bourbon tasting and hot lather shaves were on the docket. After a quick regroup to change shoes (anyone who was there knows how horrible walking around Friday was), we headed back to the Sheraton Bar and chatted with Dwayne Hayes of Absinthe, a journal dedicated to publishing Eastern European translations. Then we headed up to the AWP dance party, which was exactly what you’d expect, and nothing like what you’d expect. Awesome time, and we wrapped up the night with Adam Cushman of Red14 Films, Jeff Parker and a few other fine folks at Dillon’s. All in all, a fantastic trip, despite the travel struggles. Definitely looking forward to Seattle next year. Before we left, we did manage to indulge in some amazing oysters and seafood, which left us feeling gluttonous, satisfied and exhausted—which seems like the perfect way to describe a post-AWP hangover. Joe Sacksteder’s the best, and so are his teeth.